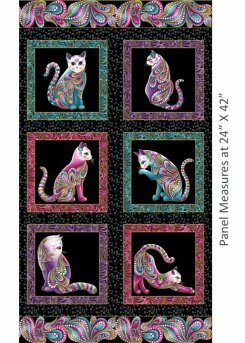 Cats with attitude and more! Jackie Robinson has just outdone herself this time. We love the jewel tones and metallic gold in this panel. We have it in both colorways, too. You choose black or white background. The coordinates are gorgeous as well. 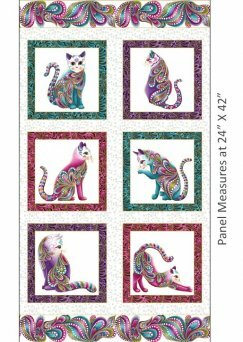 We also have several great patterns from Grizzly Gulch Designs that work well featuring the single cat blocks in their design. Come in and check them out! It's a sew day! Join us for a sew day on Saturday, September 15th. It's national Sew A Jelly Roll Day and we are celebrating the first and most popular pre-cut. I'll bet you have a jelly roll project you are thinking about, have started, or want to finish. So, pack it up and bring it along for the ride. Please register by September 1 so we can make final plans. Call the shop at 660.492.5379 or register online. We will have a corner set up at the Rotary Building on Sew A Jelly Roll Day for Cliff Eldridge. Bring in your machine for routine check-up and maintenance. Cliff has years of experience working on sewing machines, both commercial and domestic. He specializes in repairing older rotary machines (non-electronic) machines. So many of us have the older workhorses and we have neglected the basic cleaning and oiling they need. Here is a chance to bring in that Featherweight or other machine for an overdue cleaning. Cliff will be available 9:00 - 3PM during Jelly Roll Day for your convenience.